Do you ever get the feeling that there’s not enough time in the day? Of course you do. Everybody does. Everybody who has access to the internet, gets sucked into it’s pointy, endless, wonderfulness and ends up staring at gifs for hours (I totally don’t do that), generally experiences a time crush at one point or another. Even if you manage to avoid getting sucked into the internet (HOW?!?! ), odds are that at some point you feel like you have too much on your plate, or you should hurry up doing what you’re doing, so you can get to doing the next thing you need to be doing. Feeling overwhelmed with ‘stuff’ to do seems to be totally normal in the modern world. I quite often think that I need to take a week off work to catch up on things and then at the end of that week I wonder why I haven’t done everything I set out to do. I feel a constant need to cram more mini accomplishments into the day, but instead giving myself a mini high five that I’ve done some, I clip myself around the ear for the ones I didn’t do. The reason is probably because if I counted up the hours that I have on my (extra big, ‘got a week off work’) to do list, versus the hours I’ll actually be alive in that week, I will find that I literally don’t have enough hours in the day. The answer is simple. I try to do too much. All the time. Then I fail. Right now, I’m thinking about how I should really be planning for my wedding, or replying to messages, or hanging up laundry or any of the other things that are on my list. I’m thinking this, even though I’ve spent today photographing and writing blog posts for the next week, which was a lot of work. My blog posts have been scarce lately because I’ve been trying to keep up with other areas in my life, which gave me nagging guilt, so getting posts scheduled is a big achievement for me. Does my brain focus on that? No, my brain doesn’t have enough time to stop and think “Well done woman, good work today, we’re set for the week”. Instead, it’s too busy thinking “Hang your laundry up to dry. Hang it up. It’s important. Hang it up immediately. NOW. Ooooppp no….no, too late. Now your laundry smells all fusty. Nice one. NICE ONE.” Christ. Chill out brain. I’ve written about this before in my work life balance post and at that point, I thought it was caused by working 60 – 70 hours a week in my office job, but I’ve realised since then that feeling overwhelmed doesn’t just have to be caused by one big thing dominating your time. The amount of time we have isn’t going to change, I know I’ll just replace it by something else I could (or think I should) do. – Hire a housekeeper (that I can’t afford) and free up all that time spent running the home. This solution essentially sees me going to work purely to pay someone else to go to my house. – Eat the same food every day to free up all that pesky food planning, shopping and cooking time. Risk of nutritional deficiency is quite high, as is the danger I’ll eventually live solely on cheese. – Give up sleep. It worries me how many times I’ve had a really busy week, trying to do long hours at work and a dozen other things on top of it and my brain genuinely gives me “we just won’t sleep” as the solution. Risk of untimely demise too high as a long term solution. The actual solution is probably much more simplistic, but far less acceptable to our egos. I also think it’s much more difficult than frantically chasing your to do list around the house. Do less stuff and don’t feel bad about it. Have little think about what you’re doing all day, why you’re doing it and whether you actually need to do it. Then do less of the stuff you don’t need to and don’t tell yourself you’re failing because of it. In fact, I should try to enjoy it. For example, do I need to sit around and scroll through Instagram so many times a day? Do I need to beat myself up if my bedroom goes 10 days without being cleaned? Does it even matter if I write fewer blog posts? No. No one is dying, in the great big scheme of things, it really doesn’t make a difference. When I look back over the past 10 years, do I actually remember whether I got all those little things done? Nope. But I do remember some of the times I ended up sobbing at my desk because I felt paralysed by the amount I needed to do. I have no recollection of the exact things I was so worked up about. Turns out, in the long run, they really weren’t important. I know I’ll find doing this really hard. In fact, as I was writing the paragraph above, I started writing alternative things I could do with the time I’d save (listening to my mindfulness app more when I would have been scrolling through instagram really isn’t the point here brain. Once again, chill out). I know I’ll struggle and feel that constant need to achieve, but I’m going to give it a go. As always, I love reading your comments and always appreciate them. 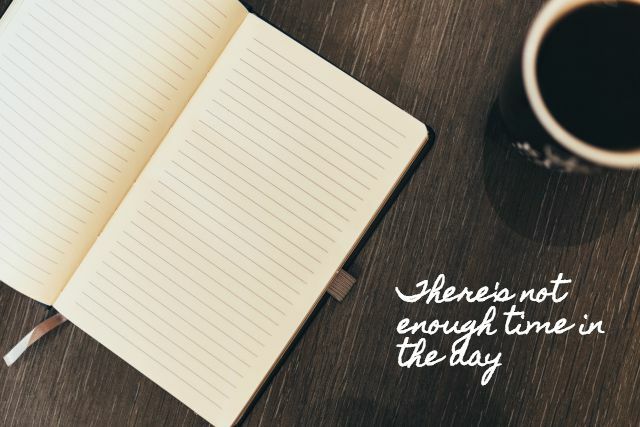 Do you ever feel like there’s too much to do in the day? What do you think is the best way to handle it? If you could only do one thing today, what would still be important?